This little Coleman 4D LED Camp Lantern lights up a whole room! This is not your grandparent's lantern! I haven't had a lantern in my hand for years!! When I took this one out, memories of my grandmother's huge, clunky, very heavy metal lantern came to mind, and I admit my first thought was how could this one measure up? I thought that because her lantern was sturdy! The lightweight plastic lantern by Coleman measures up though, without a doubt, and only seconds of testing it brought that to light (pun definitely intended). This very lightweight, but very durable lantern is made of plastic, and has a raised, easy on/off button on the front, that is a cinch to find, even in the dark. It comes with a sturdy handle and works on 4 'D' batteries (not included). The beauty of the lantern is the amount of light it gives off. For a small lantern, it's pretty impressive that it easily lit up a whole room in just an instant. Running on five bright white LEDs, this lantern produces 54 lumens of effective light output. We set up our Christmas tree in the (finished) basement this year, and the room it is in is huge. When we saw how great the light worked on the main floor in the smaller rooms, we took it downstairs to see how it would work there too. It did the job and then some. In a word, it is impressive. I'm thinking we should have one of these on each floor. It's perfect for when inclement weather temporarily takes out the electricity, and with this kind of lantern, there is no fire hazard! The lantern can run up to 175 hours on new batteries, it is durable, and is built specifically to be weather-resistant, which means it is perfect for outside activities and adventures. 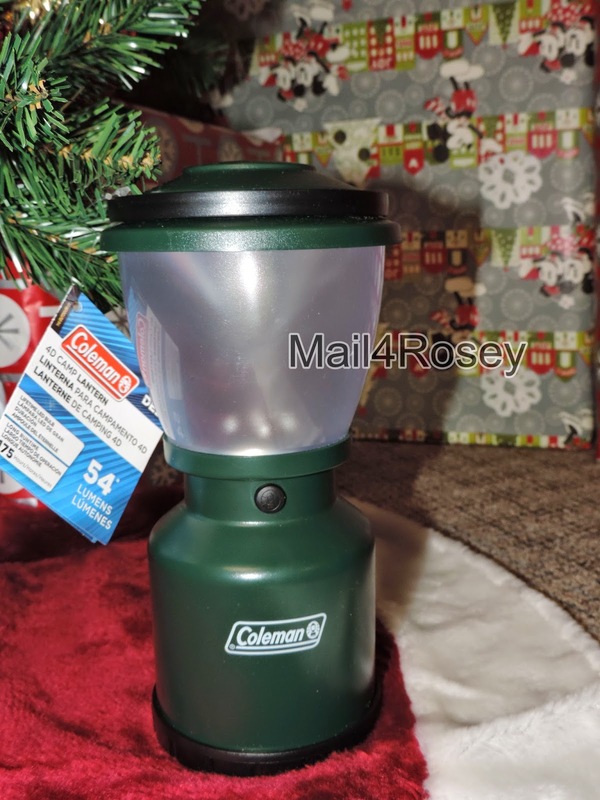 Very reasonably priced at $16.99, this Coleman 4D LED Camp Lantern is the perfect item to stock up on for your home, or to give for a gift. You can learn more about this and other Coleman product by visiting the website. You can also follow them on Facebook and/or Twitter. One lucky winner gets the same lantern discussed to call their own. Continental US entrants only. Coleman lanterns bring back so many memories of childhood and camping with my family in Upstate NY! There's no lantern like a Coleman lantern! We have a bunch of these. For home and the boat. They are amazing when the lights go out. Amazing. That would be great if the power went out or something. I should get a couple to keep around the house. I've used Coleman brand since I was a Girl Scout...... MANY years ago. Great for camping AND emergencies. This would be great for camping with the kids. I love the fact that you mentioned it was light weight and made of plastic. It makes it easy for the kids to carry and I don't have to worry about something getting broke. My husband would love one of these, he wanted one for ages just because we get load shedding so much here in SA! Its become a need instead of a want. Coleman has a great history because they have great products! It's always been our family go-to for camping brand. i WOULD LIKE A 6 PERSON TENT. This would be such a handy item to have, especially if there was a power cut! Such a shame I can't enter as I'm in the UK! 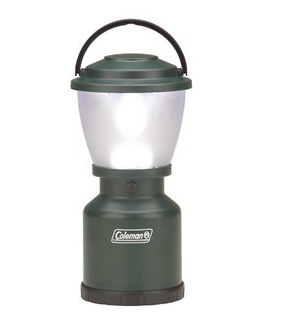 The old Coleman lanterns were good and bright, but an LED one would be a lot safer and easier. to use. This looks like a great Lantern. We don't camp but we keep a couple around for Hurricane season. It looks like an awesome lantern I have always loved using their products!! I love the SLEEPING BAG MUMMY YOUTH BOYS! I'm not even a camper, and I have this lantern. It comes in handy for so many things beyond camping! We always take Coleman laterns camping with us. My parents did so we do now too. Coleman makes the best camping products. I would love to have a lantern like this one. Wow what a great product! I love Coleman and lanterns, such a great product. I really should get me one of these! I think it would come in handy for small space lighting, like when I have to go up in my attic! It would be so cool to have one of these for emergencies and when I'm looking for something outside at night. I lose things sometimes lol. I got a Coleman lantern for camping. It works perfectly! You can enter the code pitch20 to get 20% off tents. I'm glad you pointed out that the on/off button is easy to find - even in the dark! Anyone who has ever fumbled around in a tent (trying not to wake up anyone else) trying to turn on the light will truly appreciate this feature! I like the Tent Fan. I've always wanted to have this. My dad gave my brother and I smaller version of this when we were kids, but well, we were kids so it broke when we were playing "camping" in our living room. It would be cool to have one again and this time, I will make sure that it stays functional for the rest of its lantern life. I checked out their website and really like the Oversize Quad Chair with Cooler - Blue. I like: AllinOne Portable Sink. I never knew they made such a thing. This lantern would be awesome. I learned that they are offering free shipping and they have a huge selection of stocking stuffers available. I would totally try one of these! We have always wanted to go camping. The instant tent looks nice. I really like one of the portable grills! I like the Premium Queen Airbed w/ 120V BIP. I like the CPX 6 Triago lantern. that they do daily deals on their site! I love the Coleman lanterns. All my girls have these small ones and have used them over the years when camping outdoors and even indoors. I like the ROADTRIP® GRILL LXE. I like the 50 Quart Xtreme 5 Wheeled Cooler. Lanterns have come a long, long way. I wouldn't mind winning this! It would be perfect for camping. We actually have a really old Coleman lantern and are due for an update. The Roadtrip Grill LXE looks nice! wow! This would be a fantastic gift! I love Coleman anything! Thanks for your thoughts. There are Coleman outlet stores! I really like the Reclining Beach Chairs! I learned that Coleman makes/carries a TON of products. I love that they organize gifts by price. This would have been nice to see prior to Christmas. I learned they are currently having 20% off tents. I like the Tent Fan~how Awesome!! I like the grills and coolers. I would love to have one of the emergency stoves they've got. Would really come in handy for the long power outages we sometimes have due to winter storms. I really like the ALL-IN-ONE INSTASTART™ COOKING SYSTEM that is a grill, stove and griddle all in one product. I learned that they have a Coleman Camping Cookbook app. I also like their NXT 50 table top propane grill. I'd also love the OVERSIZE QUAD CHAIR WITH COOLER - BLUE! I like the Orange Beach Chair Recliner. I like the Coleman 24 Can Cooler Satchel. Everything Coleman camping! So many childhood memories with Coleman! WOW, love the Coleman Instant Tent 8 - 14' x 8', very nice. Hello! I'd like to have their Road Trip Table Top Charcoal Grill. My husband would be thrilled! Thanks!! The Aerobed a Camp bed and pool float is one of my favorites. We like to use air mattresses when we go camping. I like their stackable coolers. Coleman has camping coffee makers. coleman has been making reliable products for a long time!! I like the NXT 300 Grill. I like the 9 FT. X 7 FT. Instant Canopy. It would be fun in the summer. When you camp, Coleman is a must! I like the 50 QUART XTREME® 5 WHEELED COOLER. I really like the Extra High Queen Airbed w/ AC/DC BIP! Their mummy sleeping bags are nice. I love the Coleman brand - I didn't realize they had such a wide variety of products! Thank you for the giveaway opportunity. i may have posted on the stacker cooler giveaway i found out that they have a daily deal - todays was REVERSA WRAP™ REVERSIBLE SLEEP SOLUTION amy wen 117669sSoulmate! I would love the tent fan! They have a camping coffeepot! Coleman is an awesome brand.. we have so many of their products! Love their canopy's! I didn't realize they have so many different styles of lanterns! I have been looking to buy a couple to add to my hurricane box. I like the 10 ft. x 10 ft. Screened Canopy they have on clearance sale. I love the camp oven, with living in the south we get ice storms in the winter months taking the electricity so this would be perfect if the power went out. i love the PREMIUM POWERHOUSE® DUAL FUEL™ LANTERN. i could really use this when our power is out- which happens a lot during hurricane season. I love the 10ft x 10ft screened canopy. I really like the 10X10 screened canopy. i like the PERFECTFLOW™ INSTASTART™ LANTERN. I also love the 54 Quart Coleman® Stainless Steel Cooler. I like their Day Trip Package. I see so many awesome things for my family camping. The thing I like best is the PACK-AWAY™ OUTDOOR PICNIC SET FOR 4. Make thing easy for sure. I also love the ROADTRIP® GRILL LXE. I like the 10-Cup Portable Propane Coffeemaker. Thanks. I like the 54 QUART COLEMAN® STAINLESS STEEL COOLER It would be great for our camping trips. I really like the NXT 50 Table Top Propane Grill. I like the PerfectFlow InstaStart Grill Stove. I also like the ComfortArc High Back Sling Chair from Coleman. I like the COLEMAN® 6-PERSON SUNDOME® TENT. I like the Rugged Queen Single High Airbed. Thank You for the giveaway…we like the 20-can Party Stacker Coleman Cooler ! They have a big clearance section on their site. with some great prices.